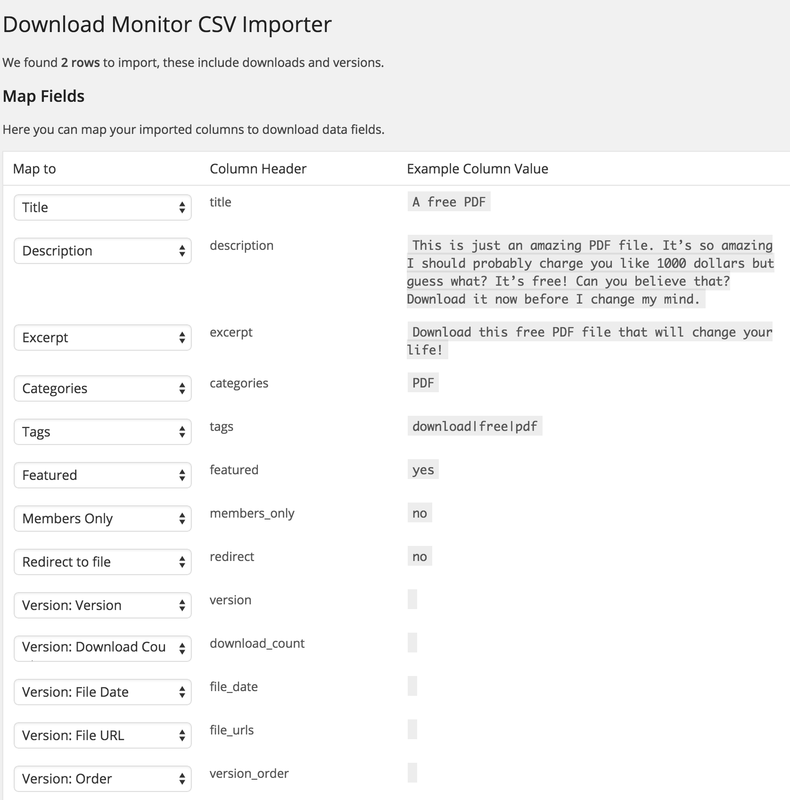 Mass import up to thousands of Downloads into Download Monitor with the CSV Importer. This user-friendly importer, with clear step-by-step instructions helps you import Downloads including their categories, tags, files into Download Monitor. Before you can start the import process you need to create a CSV file that contains the downloads and version you want to import. We’ve created an example CSV file you can use that contains the default headers, a sample download row and a sample version row. Note the first column in the CSV file named type, this column defines if the row is a download or a version row. In this example Version A and Version B will be attached to Download 1 and Version C will be attached to Download 2. After installing the extension head over to Tools > Import and click on the Download Monitor CSV Importer link. At the next step you can ‘map’ the columns found in the CSV file to download data fields. The extension will try to map as many columns automatically by recognizing what columns are what fields. Note that this overview contains both download and version fields, not all fields are used in every row because download rows take different fields than version rows. After you’ve mapped all columns you want to import to Download Monitor fields press the Start Import button. After the import is done you will be redirected to a page telling you how many downloads have been imported. In WordPress Multisite(Network) you need to add the csv file extension to the list of allowed file extensions in the network wide general settings. How do I add multiple categories/tags? Enter all categories/tags you want to attach to a download in one column seperated by a pipe |. How do I add multiple file URLs per version? Enter all file URLs in one column seperated by a pipe |. Can I import custom meta fields? Yes you can! Simply add them to your CSV file and select ‘Custom Meta’ in the mapping screen. A new text field will appear, enter the desired meta_key in this textfield. The importer will now import the values of this CSV column to the entered meta_key. You can enter the same meta_key multiple times for multiple columns as we add the meta values instead of replacing them.